Additionally, the sharply cut expectations - which are barely being beat- has resulted in a generally favorable response to earnings reports. EPS and sales beats have outperformed by 2.5% the next day, which would be the biggest reward since 3Q15. On the other side, misses have underperformed by 1.3%, less than the historical average underperformance of 2.4%. In Industrials, Tech and Discretionary, misses have actually outperformed the next day (particularly in Industrials). This is following a severe valuation de-rating in many areas of the market in 2018, particularly in global/trade-sensitive areas. Of course, if consensus outlook rerates lower, the market will soon realize it rewarded companies for an EPS rebound that will not happen, and a delayed selloff may ensue. 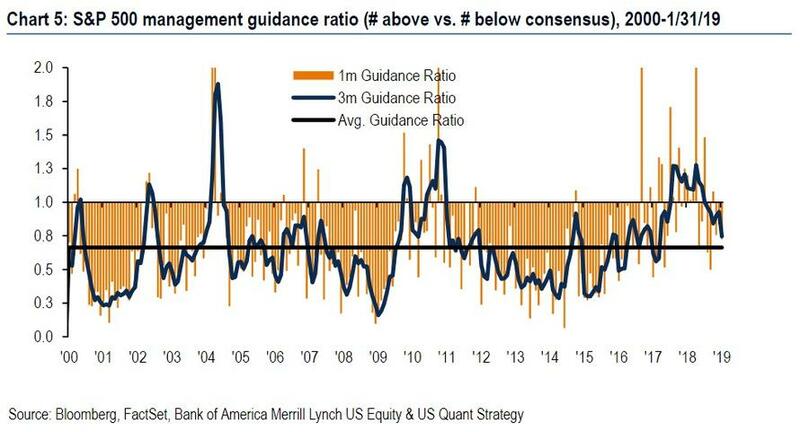 Going back to guidance, BofA notes that while it is weaker than average, management typically tends to set a low bar in January. Specifically, in Q4 the ratio of above-consensus vs below-consensus earnings guidance was 0.73 - a four-month low, but above the typical January average of 0.53. This puts the three-month ratio at 0.75 - the lowest in nearly two years, but still above the long-term average of 0.66. Guidance in January was weakest in Industrials and Tech, and strongest in Consumer Discretionary and Real Estate. The tenor of conference calls has been mixed: mentions of "better" or "stronger" vs "worse" or "weaker" are the lowest since 4Q15, as corporates see slowing trends. Ironically, mentions of "optimism" are tracking near record highs - see the charts below. One potentially politically sensitive issue is that a sharp slowdown in capex growth is likely amid uncertainty around trade/tariffs, the government shutdown, global growth, etc, which has begun to impact companies' spending plans. 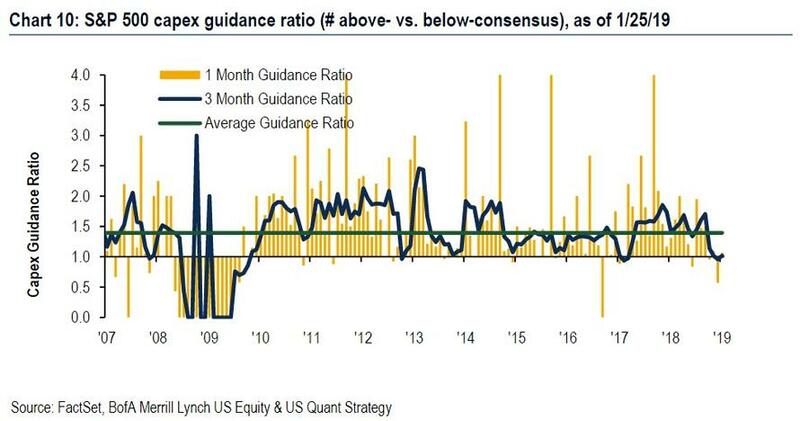 In January, the ratio of above- vs below-consensus guidance on planned capex was 1.1x, putting the three-month ratio at 1.0x - an uptick from December, but still near a two-year low and below the long-term average of 1.4x. 4Q capex growth for reported companies is tracking +11% YoY (vs +13% for the full index in 3Q), or +9% for the median company (vs +13% in 3Q). As BofA notes, a fall-off in capex poses risk to Tech and Industrials, the two sectors with the weakest earnings guidance ratios in January. Indeed despite strong earnings, both Facebook and Google were hit following earnings reports that showed sharply higher spending; any deviation from this would likely result in a hit to the top and bottom line.